MOWI 850 is a 9-ton timber trailer equipped with MOWI's specially designed forest bogie and carriage control. Telescoping legs as standard. Great but still smooth in the woods with a width of about 2 meters (0.5 400/60x15 tires). The load area is despite the low load height throughout the 2.0 square meters. 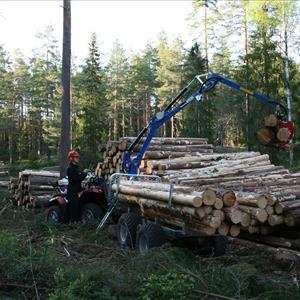 Is suitable for the transport and handling of pulpwood, firewood and timber. Can be used to resolve all common lifting and transportation needs on the farm. MOWI 850 forestry trailer is equipped as standard with MOWI P25 - a newly developed crane model with all the unique, easy to drive high accessibility, stability and safety. Oil Flow is only 20-25 l / min. In addition, P25 improved movement patterns and better parking position. The range is 5.2 meters and lifting capacity of 400 kg at full length. Crane options Mowi P30 with range of 5.7 meters and lift 450 kg at full length.